This family-run hotel boasts an excellent restaurant with a good choice of local and national food. 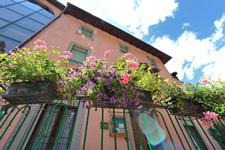 The Hotel is equipped to welcome bikers and cyclists, families and small groups of friends. The house is open all year round. The art of hospitality since 1930. A 3 star family- run guesthouse for unforgettable holidays in the Alps. Open all year round. 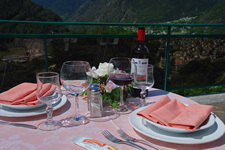 Italian food and typical dishes are served at the restaurant La Terrazza, a perfect setting for a dinner with friends and family, banquets, weddings and all kinds of cerimonies. What is better than resting on a deckchair by the pool on a sunny day? The Hotel Torre has a fantastic outside swimming pool for lazy summer afternoons. Water – the element of life – will help you to regenerate and feel great.